Everyone needs love. Even grad students. In West of 10th’s production of Itamar Moses’ Completeness directed by Andy Scott, Elliot and Molly find an emotional bond that unite their hearts and algorithms. 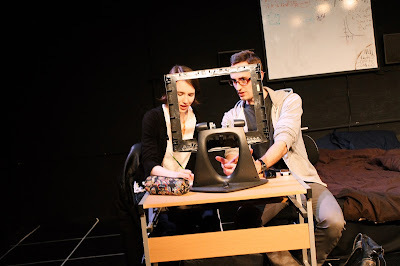 Originally produced at South Coast Rep then Playwrights Horizons, Completeness follows Elliot, a computer scientist, and Molly, a molecular biologist, who happen upon the same computer cluster and form an undeniable connection. Littered with brainy dialogue, Completeness is more than a play about science, it’s a play about emotional bonds and relationships between opposing forces. Completeness is a very specific story. Moses has a smartly intricate text that is science on the surface but filled with subtext. And that is what makes Completeness accessible. Unfortunately, with perhaps the exception of Joe Pietropaolo, the company didn't quite grasp this. It was hard to uncover the importance of the context if you didn't believe the actors understood what they were saying. It sadly felt like regurgitated textbook passages as opposed to important plot driven dialogue. As a whole, the execution was clunky. Director Andy Scott did his best trying to steer the ship and bring out the nuances of Moses’ exceptional text but authenticity can only go so far. Completeness is a story of intimacy that requires chemistry. And Joe Pietropaolo and Rachel Goodgal had spurts of chemistry as Elliot and Molly. Pietropaolo was fit to portray Elliot. He was affable and appealing. He was able to make Elliot the driving force of the production. Molly tends to be a monotonous character but Goodgal didn't offer any moments to add any depth or flavor to the character. The end game was clear for Molly. There was little mystery. As the characters of conflict, Therese Dizon and Terrance L. Johnson played up villainous caricatures. This allowed you to root for Elliot and Molly to succeed despite the odds. From a production standpoint, there were elements that worked and other things that didn’t. The set by Christina Tang was clever. The grid floor fit the scientific world. It would have been interesting to see it extended onto the walls of the Jewel Box theater. Though they caused some occasional site line issues, the holed out computers allowed for Scott to create some engaging stage pictures. The computers on the back wall that provided occasional photos of scene locations didn’t quite add much of anything. The lighting from Maryam Sweirki was virtually a basic wash and it was a bit harsh. Tackling Itamar Moses and Completeness is for the brave. This was an ambitious undertaking for West of 10th that didn't quite pan out.